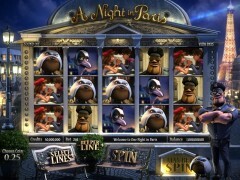 A night in Paris released by Betsoft is one of the latest HD slots and you can see that this slot means business. The name seems a bit cheesy, but in fact it is very describing and it is not based on some dishonest woody Allan. It has taken the most famous items from France and put them into a slot game to create an interesting 3D slot with best features that will keep the player happy. There may not be any city whose symbols are more recognizable. By playing A Night in Paris from Betsoft, you can at least live out one night in the French capital. So just decide to give this romantic, five reels, thirty pay lines slot a go in its pay version form and win a real, multi-day trip to this city. It basically begins by making a bet that ranges from as little as $. 02 to as much as $85. Then the player begins his leisurely walk down the streets of Paris by clicking on spin to get things moving. There are three bonuses, which make this game stand out. The Chase Free Spins is the first feature, which gets activated by three police symbols. A random prize can be gained by this bonus. In the meantime, if thief and badge come up in that order will also earn you a prize amount. You will enter the Caught in the Museum Bonus, if three or more Napoleon icons appear, and again, get the benefit from a prize determined at random. The game actually revolves around a fantasy, animated, crime story that takes place in Paris. The symbols of the Eiffel Tower, a croissant, the Venus de Milo, a thief a romantic French couple, and a cop, are apparently characters from this story. These are nicely balanced by an interface based on a typical, Parisian street. It’s all enough to convince and move beyond the presentation of the game. A Night in Paris has three important characters, Jerome, who is the security guard, Pierre, which is his guard dog and Jacques, who is the thief. Jerome signals in excitement when a prize rolls in, or becomes irritated when you leave him standing still for a long time. Betsoft have provided the option to listen sound on the slot, there is a nice touch whenever you wish to listen to music or simply not a fan of the sound effects. The bet is regulated with the five buttons near the bottom of the screen. You can select to play one line for thirty and opt to use from one to five coins per line. A Night in Paris with its three bonus features (the Chase Free Spins Mode, an instant prize bonus, and a Caught in the Museum Bonus) set it apart from many of the games today. A Night in Paris offers three fantastic features; the simplest is the awarding of free spins that is when three or more police badges come out. A grouping of the police badge, thief as well as the guard Jerome helps to unlock a multiplier. Whereas the interactive feature “caught in the museum” is get unlocked by 3 or more paintings where you can catch the thief and get the prize. There is a complete pile of different symbols in these games which show something that we see as typically French. The Eiffel Tower as well as a goose makes an appearance. No standardized slot symbols are there in this game which you really have to hail for betsoft. This application has always put more effort into their games to create their own unique symbols and enhance the gaming experience. From my first experience, I really love this slot. It just fits well with my style of playing.